Have you ever tried hunting for elk or any other animal without the proper gear on? It happens, and I know how uncomfortable, not to mention, dangerous it can be. It’s the new year and one of the best resolution you can come up with and follow through is to get your hunting gear up to par with the professionals. The months fly by so fast and before you know it, September is right under your nose saying that elk season is right around the corner. And without the best elk hunting boots, you will not be able to go hunting without the possibility of accidents sticking out like a sore thumb. So if you really plan to take hunting with your buds seriously, then you definitely have to have the best hunting boots for the occasion. These 3 elk hunting boots can help you get the job done without slipping and falling behind because your boots are not the right ones or they are too heavy for hiking and trekking in the woods. You may have already started your research for the best elk hunting boots but the ones on our list aims to cut your search time in half. So let’s take a look at the top three hunting boots and find out which ones cater to your needs in terms of specifications and your budget. 6.1 Question: Do elk hunting boots come with a warranty? 6.2 Question: Can I return my boots if I am not satisfied with them? 6.3 Question: Are they easy to maintain? 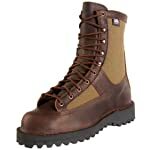 Irish Setter Men’s 882 Elk Tracker is considered to be the one of the best choices when it comes to elk hunting boots. Made by Irish Setter from Red Wing Shoes, the boots are best known for ensuring safe and worry free hunting since the 1950’s. And because the brand has been protecting hunters’ feet for generations, it is definitely deserving of being part of our line-up for the best elk and deer hunting boots for this year. What makes the 882 Elk Tracker so noteworthy? That would be the kind of technology through which these boots are designed, created and manufactured. The boots are made of premium work-grade leather. The leather is tough yet very comfortable. Seasoned or veteran hunters can attest that the boots are so easy to wear and break-in. Which means that you and your feet will not have a hard time adjusting and fitting in these boots. Rated 4.5 stars in Amazon, this line of hunting boots can easily help you gear up in style without sacrificing quality and safety. 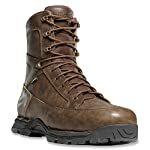 Wet and slippery terrains are a no match against a pair of Irish Setter Men’s 882 Elk Tracker. Designed and manufactured using innovative rubber soles known as Vibram, hunters will find it satisfying to know that the outsoles provide top notch traction and have an extremely high resistance to different types of terrains, weather and environment. Heat is another factor that this brand of hunting boots has got covered. The outsoles are also heat resistant so even if you tread paths that are as hot as 475 degrees F, you don’t have to worry because your boots will not melt or crack or pull apart. With sizes ranging from 8 to 13, you can make sure that there is a pair that will fit you. It even offers extended sizes, given that you have your size measured and ordered in time. And speaking of fit, the interiors are as well a work of art. Each pair will have removable comfort corks made up of high-grade memory foams. And even if you sweat through your socks or in your boots for 48 straight hours, you do not have to worry about odors and moisture because the boots are equipped with ScentBan odor control, made exclusively for Irish Setter. Elks live in the toughest and the harshest of terrains in North America, which means that you need really heavy duty hunting boots that can handle these conditions plus more. The Irish Setter Men’s 860 Elk Tracker is seriously one model that you can rely on. The technologies used to create these boots are perfect for all sorts of weather conditions including extreme cold. Made using 3M Thinsulate Ultra Insulation, your feet will be kept warm in negative degree weather, without you feeling weighted down. The insulation is thin enough to ensure that your movement will not be slowed down, but strong enough to keep your feet warm and dry. If there is one thing that you need to take note of is the weight of the entire package. It’s about 4 to 5 lbs. per pair of boots, depending on the size that you will be buying. Now, if you are on the lighter or skinnier side, you may want to break these in before heading out in the woods. The weight can easily slow you down if you are not yet used to it. The weight helps the sole to get a better grip on the ground. It is also affordable even for those who are hunting newbies. Irish Setter Men’s 880 Elk Tracker is another model that you can consider as one of the best elk hunting boots in the market. Perfect for any weather and environmental conditions, these boots can help you ensure that you will not find hunting for elks a little less challenging and dangerous. The boots are breathable and well insulated thanks to their Gore-Tex and it’s 200 gram Thinsulate Technologies. The upper portion of the boots are made of top-notch Maderia full-grain leather as an added comfort and movability. Hunters and hikers will also appreciate the removable memory foams that you can easily insert in the boots. The foams will help your feet adjust and feel comfortable even when running, hiking or trekking through uneven ground. It is also lighter than the other models since the pair weighs 2 lbs. in total. The weight of the boots can help you move around and track elks and other games faster and easier. Always remove all the dirt stuck in between the soles and even on the surface of the leather. If they are extremely muddy and cannot be removed by brushes or dry rags, wash them off and dry them immediately. Use high-grade leather protectors and natural seals specifically for waterproof or non-waterproof hunting boots. Use the right kind of leather conditioner to ensure that the leather will continue to be soft and flexible. This will also help you ensure that the leather will not crack even under the hottest of temperatures. Question: Do elk hunting boots come with a warranty? Answer: Yes, these hunting boots often come with a 12-month manufacturer’s warranty. This warranty covers any defect which might have been caused during the manufacturing or shipping stage. Question: Can I return my boots if I am not satisfied with them? Answer: Most hunting boots manufacturers and distributors accept returns especially when the boots do not fit, there are defects even before usage, or they do not perform to your standards. You have to, however, keep in mind that each company has its own return policies, so be sure to carefully read them to avoid any problems. Question: Are they easy to maintain? Answer: With a few simple steps, you can easily maintain your pair of hunting boots. You just need to make sure that you use the right products and tools to avoid damaging them. We are positive that these 3 will help you find the best elk hunting boots for your upcoming hunting trip with your best buds. And while you are waiting for elk season to open, take time to recharge, restock and complete your hunting gear and gadgets – this way, you can ensure that you will have a safe, worry-free and a really rewarding season. Hunting boots are equipped with a variety of features in the upper section of the footwear to provide breathability along with durability. Scent-free rubber boots are substantially waterproof but do tend to get overheated on your feet which may be a negative aspect when hunting in the warmer areas. An insulated boot provides adequate protection against the cold air, complemented by liners that trap residual heat. The high the weight of the insulation, the warmer the hunting boots will be. I bought the Irish setter 880 elk tracker. And so far they feel good. I have just been walking around inside my house. To break them in . Going up and down the stairs. Walking bending. I have a pair of Irish setter Hunts , that I have had for a year.. love them.